On September 17th 2010, 11 Year old Cadet Driver Tazio Torregiani returned to one of his favorite kart tracks: The reconfigured Tempest track at NJ Motorsports Park. He arrived full of confidence, Thanks to a fine win the previous weekend at the same track, his second this year in WKA NJ divisional races. This time the street fight was going to be with a different gang: The WKA Man Cup National Series, Cadet Class. Perhaps the most competitive sprint kart racing in the country. This was the last race weekend of the 2010 season. Thanks to a very productive Friday practice, On Saturday morning Tazio was able to qualify 11th out of 26. After an off in the grass in turn one, Tazio finished Saturday’s final race in 12th. Sunday was a new day. Tazio returned to the pits after morning practice eager to improve the chassis. So, together with Dad Patrizio and Brother Dario, the Torregiani team was able to find the right setup. Tazio hit the track for qualifying determined to go faster, and in his second flying lap, he managed to qualify second, in the front row, 1 tenth of a second, from pole. The third lap could have been even faster, but came too close to the driver on front on the straight. This was Tazio’s finest drive yet and he knew it. Tazio started the pre final and jumped in the lead in turn one. He led the first lap. His luck wasn’t going to last. On the fourth lap his motor (the Hornet) started losing RPM and slowing down. The tip of the spark plug became loose and came off inside the boot loosing spark. Tazio very rapidly lost many positions. He nursed his #07 kart home and barely finished 20th. He did manage to secure fastest lap of the race at 1:15.1 on the third lap, which was to hold fastest lap of the weekend in cadet class. Tazio started his Sunday final race in 20th position, and again drove great to make several passes and stay out of trouble to finish in 11th position. The results were no indication of the potential. Tazio finished his first National season knowing that he has the speed to race with the best, and can’t wait for next season. Tazio and the Torregiani team would like to thank all their supporters and sponsors, including http://www.newcountryporsche.com/ and http://www.vincentgarage.com/. For more info visit http://www.taziotorregiani.com/. Last month our racing team made the Greenwich Citizen newspaper again. 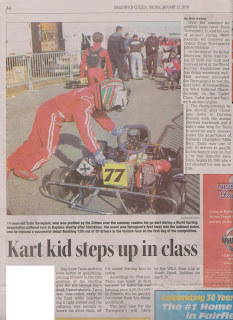 It's the third time now the local tabloids find interest in the 11 year old race driver. Sports writer Rob Kelly did a follow up story on Tazio after his promising Daytona National race debut. You can read the article by clicking on the photo. Our family would like to thank Rob again for his memorable articles on our team.